THE VERY SIMILAR CHAIR SOLD BY PANASONIC FOR $3,999.00 !! !, BUT THIS CHAIR HAS MORE FEATURES!!! LIKE MP3 PLAYER, MEMORY CARD, USB CABLE AND ADAPTOR, HEADPHONES, COCKTAIL SOLID WOOD TABLE, MUSIC SYNCHRONIZATION, ETC. SAME CHAIR AS FUJIKURA A-12 and OMEGA SYNKE-5000, BUT FOR A 1/3 OF THEIR PRICE. <?xml:namespace prefix = o ns = "urn:schemas-microsoft-com:office:office" />THIS CHAIR IS SOLD BY US BRAND NEW, NOT USED, NOT FACTORY REFURBISHED LIKE MANY OTHERS. YOU WILL RECEIVE THIS CHAIR IN A FACTORY SEALED NEVER OPENED NEW BOX. WE ARE FACTORY DIRECT CERTIFIED DISTRIBUTORS FOR THIS MASSAGE CHAIR IN THE UNITED STATES, BUYING DIRECTLY AND SELLING DIRECTLY TO OUR CUSTOMERS, THE ONLY WAY WE CAN ABSOLUTELY OFFER THE BEST PRICE. PLEASE CONTACT US IF YOU FIND IT DIFFERENT ANYWHERE ELSE. Have you ever wanted to return from work and just relax while having a full body massage? Even once a week? Well, YOU CAN HAVE IT DAILY!! !, 24 hrs. a day, while doing what ever fits you better at that time. Many sellers offer the very similar product for a much higher price even if refurbished. WE DO NOT SELL ANY REFURBISHED PRODUCTS, ALL ARE NEW IN THE ORIGINAL FACTORY BOX. This luxury chair is fitted up with one set of VERTICALLY MOVABLE QUAD-ROLLER AND SOUNDPROOF MECHANICAL MASSAGE HANDS. YOU CAN ADJUST THE VERTICAL POSITION OF THE MASSAGER AT ANY POINT OF YOUR BACK YOU WISH, UPWARD and DOWNWARD FROM THE VERY LOW BACK TO YOUR NECK. This chair offers the best of the SHIATSU MASSAGE. Equipped with REAL HUMANIZED MECHANISM MASSAGE HANDS, FUNCTIONING WITH 6 MASSAGE FUNCTIONS: Rolling (Back Stretch), Kneading, Flapping, Kneading & Flapping, Shiatsu, Knocking and Vibrating. 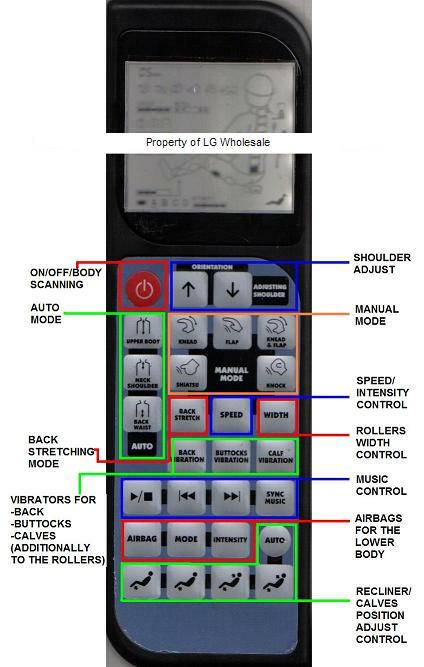 The BLUE light LCD Control shows all the massage functions, width of the massage hands, massage position and many other functions. The back light will last one minute after the massage stops. MANUAL and AUTOMATIC modes are offered. 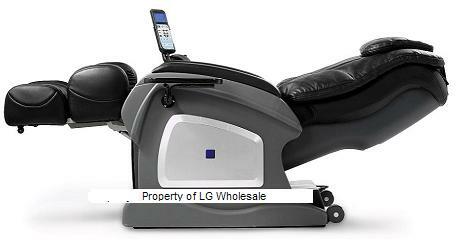 Under the AUTOMATIC mode, it offers multi-functional automatic massage methods. It has three combination massage options for the whole body, the shoulder and the neck, and the back and the waist. Under the MANUAL mode, it offers three options of appointed massages in different regions of the whole body, while the positions of the massage hands are adjustable. Each massage function has three-level speed options; the width between the massage hands is adjustable to three positions (Wide, Medium and Narrow). The SEAT CUSHION is mounted with eleven air bags, the CALF REST is mounted with ten air bags, which provides four air-massage combinations, with 2 intensity levels, the FOOT REST is mounted with eight airbags as well. The CALF REST and FOOT REST is power-lifted as well as the RECLINER, you can adjust its position with a single touch of your finger, ISN’T GREAT? By the way, this chair massage function STARTS with an AUTOMATIC SHOULDER-BACK FULL SCANNING PROGRAM which determines your EXACT BODY SIZE and then, be able to provide a unique personalized massage. You will get a fully healthy massage from your NECK and SHOULDERS, to your COMPLETE BACK and WAIST, to your BUTTOCKS, THIGHS, CALVES and FOOT!!! Is not this what you ever wanted? It is like having a personal masseur on call 24 hours a day!!! Now, every day, you can treat yourself to the soothing pleasures of real massage... All along your spine!!! and of your calves!!! And your feet too!!! a) Rolling: When moving up and down, it functions like the fixed-point of revolving finger pressing by professional masseurs for more direct and effective massage effect. b) Kneading: Reduces muscle pain and works out knots. c) Shiatsu Results: Power rollers are used to give you the experience provided by masseurs, relaxing muscle stress, reducing fatigue and rejuvenating the mind and body. d) Percusssion & Compression: Improves flexibity. mobility and posture of the legs. e) Chop Action Tapping and Flapping: Reduces soreness and ache fasten, relax stiff muscles and soften thick layers of fatty deposits, stimulate nerves and stressed muscles. f) VIBRATORS, at the foot, calves, seat cushion and recliner. Feels great combined with the rollers at the back!!! The Vibration massage function stimulates the dilation of blood vessels. This helps create an elimination of impurities and toxins in your blood, tissues and organs. - “MP3 PLAYER, with integrated MEMORY CARD and USB adaptor, to download your favorite music. A) The intensity and speed of the back massage reacts along with the high frequency of the music. B) The intensity and speed of the buttocks vibrators react along with the medium frequency. C) The intensity and speed of the calves vibrators react along with the low frequency. - Digital High Quality Headphones, to relax and forge the external world. - Solid Wood Cocktail Table. - "S" Type Ergonomic Straight chair back with 2 layers backpad. An Extra Removable Pad is NOW included. - Humanized massage integrated with multi manners: walk, sway, scratch, knead, press and tap. - Controlled by electricity and air enforce the massage on the calves and feet. - Unique movable massage to a larger area. 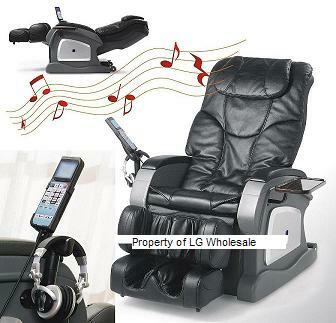 - Multi-posture Zero Gravity Electric Reclining, only needs 7 inches against the wall. - Multi-posture under horizontal electric reclining, up to 180 degrees (FLAT HORIZONTAL, LIKE A BED) to promote the better blood circulation. - Adopted Advanced Computer Chip and Digital Control Technology. - Health Care and enjoyment integrated in one machine, explain a popular Concept of HEALTH. - Quiet, noise-less motors to improve the relaxation. - 320 lbs. weight capacity. ASSEMBLY: This chair comes fully assembled, just need to adapt the remote controller holder and the solid wood cocktail table. COLORS: BLACK, BEIGE and CREME. These colors look so elegant and beatiful that you will be proud to have this toy in your place. MATERIAL: Soft, Easy-Care Match-Leather. Looks and Feels Just Like Genuine leather - But More Durable. Reason: Genuine leather can wear down from the frequent wear-and-tear caused by the movement of the massage components against the back. You will get the best appearance, comfort and durability. Also, the armrest comes in solid wood, waoa, so elegant (TAKE A LOOK TO THE PICTURES, and DECIDE IT YOURSELF) .